Source Cycles in Chengdu is one of the few places in China where one can buy a hand-built bicycle whose frame is made of bamboo. Owners Jacob Klink and Larry Adamson build the frames themselves. 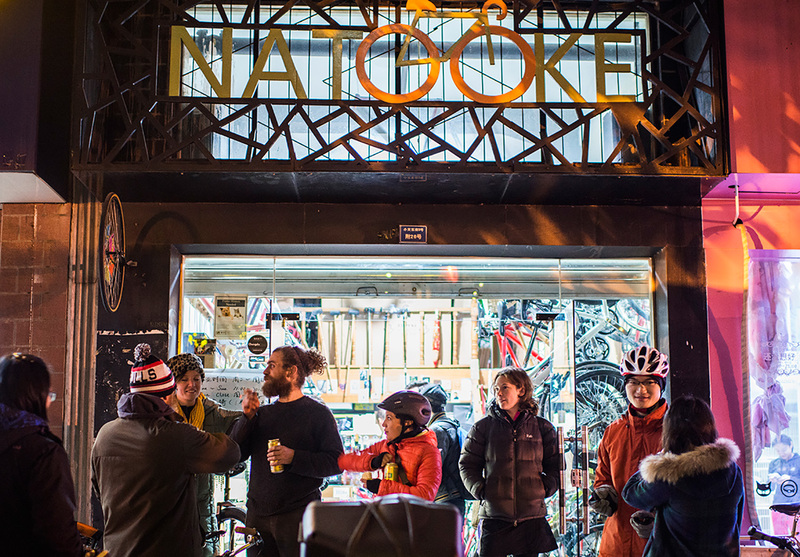 Halfway down a side street, nestled between a hair salon and a massage parlor, sits Natooke, Chengdu’s only wholly foreign-owned custom bicycle shop. Inside, along the left hand wall, are shelves filled with gears and pedals and handlebars: pink, red, neon green, black and white, matte, and glossy. Along the opposite wall hang finished bikes. One is baby blue with silver trim; beside it, hanging on a sturdy hook, is a blood red and brown leather work of art. A hot pink number with snow-white pedals waits for its owner to stop by and take her home. And yet much of it is. In the back is a toolshed where bicycles are assembled. Expatriates living in this city of 14 million—the Sichuan provincial capital—come and visit the shop, many riding off on Natooke bikes of their own. Squads of young Chinese cyclists show up. The custom-made bikes they park outside draw small, curious crowds. There may be a race through the city that night, or a weekend assault on the biggest hill in the area. Bike polo starts around 3:00 p.m. in the plaza beside the old stadium. A skinny dog named Peggy lounges out front by the display bikes while the shop buzzes with music drifting in from the back, where the shop’s co-owner and chief mechanic, Jacob Klink, puts the finishing touches on a coal black touring bike. There was a time when selling bicycles in China would have been a no-brainer. For much of the 20th century, bicycles were the primary mode of transportation for hundreds of millions of Chinese. That began to change in the late 1990s, when the bicycle went from indispensable tool of the proletariat to inescapable symbol of poverty. The number of people riding bikes dropped by 2 to 5 percent annually from the 1990s to 2010, while the number of car owners skyrocketed during that same period, from 5.5 million in 1990 to 70 million in 2010. More than 150 million Chinese owned their own cars in 2014, a heavy contribution to choking air pollution and road congestion. Analysts estimate 200 million people will own cars by 2020. The shift in how Chinese prefer to get around means salespeople in China have to market bicycles as fashion accessories, rather than as reliable modes of transportation. The shift in how Chinese prefer to get around means salespeople in China have to market bicycles as fashion accessories, rather than as reliable modes of transportation. This is where colorful custom-made fixed gear bicycles come in. Hipsters from Brooklyn to Berlin and Portland to Tokyo have made the fixed gear bike a must-have symbol of stylish eco-consciousness. Unlike most bicycles, a “fixie” has only one gear and its drive train is fixed to the rear wheel. A fixie rider can’t coast—stop pedaling and the bike stands still. Fans consider it a purist’s bike, akin to a stick shift rather than an automatic. Fixed gear bicycles have made inroads in China, especially in Beijing, where the flat landscape doesn’t require shifting gears. But in Chengdu, Natooke has upped the style ante a notch by introducing bamboo as an alternative to aluminum, steel, and carbon fiber frames. It’s not a new concept: there are several companies around the world building bamboo bikes, including the Bamboo Bike Project, Ghana Bamboo Bikes Initiative, the Spanish company Bambu Campos, and Maine-based Erbacycles. That Natooke is building bamboo bikes in China is sensible, considering most bamboo species are native there. Natooke’s founders believed being close to the source would allow them to find the best materials and build bikes for a lower cost than far-flung competitors. Upstairs on Natooke’s second floor, Jacob’s partner, co-owner Larry Adamson, is rummaging through stacks of grasses and bamboo tubes. 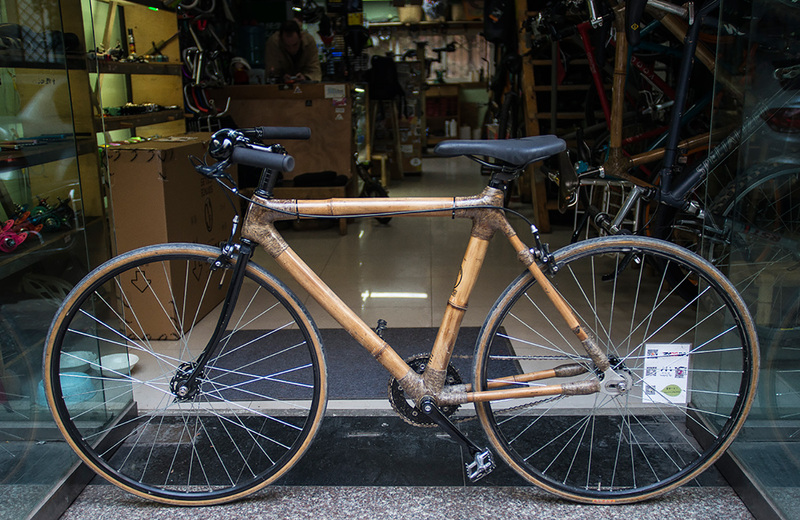 He and Jacob call the shop’s bamboo initiative Source Cycles. Each bike is built by hand using cured and treated bamboo poles, hemp-like grass called huangma from western Sichuan, and hours of patient grinding, tacking, gluing, and mitering. It takes a special pair of obsessive tinkerers to survive the long jaunt through the labyrinthine world of Chinese manufacturing and the confusing taxonomy of bamboo species and epoxy recipes to come out the other end with beautiful, functional bicycles that attract buyers from Tianjin to Sydney. The journey began in the summer of 2012, when Dan Chatterly from Cheltenham, England and Mandeep Singh from Singapore wandered into a Natooke Chengdu bike polo session inquiring about a workspace for a relatively simple plan: find bamboo, build a bike. Mandeep and Dan told Jacob and Larry tales of Sichuan bamboo forests so vast they’re called seas, and they spread out pages upon page of notes and designs to support their dream. Their enthusiasm stirred the Natooke boys’ love of building prototypes that blur the lines between functionality and art. Together, the four envisioned off-the-wall bikes with strange shapes and extra tubes. But what began as a fun three-month project with a new material stretched to six months, then a year. Then two years. The first problem was figuring out what species of bamboo they needed to make their dream bikes. Then they had to find it. There are hundreds of species of bamboo in China, each with slightly different characteristics and uses. Most have multiple common names in Chinese, and multiple Latin names as well. Experts who can distinguish between them are few and often contradict each other. On top of the trouble with bamboo taxonomy, Jacob, Larry, Dan, and Mandeep were faced with the fact that Chinese businesses tend to favor making the sale over meeting needs and solving problems. They built up their knowledge through a process of trial and error that took them all across China’s bamboo manufacturing regions. Building a bamboo bicycle’s joints takes an incredible amount of resourcefulness and work. This was a “Go Big or Go Home” problem that forced the quartet to search in small towns, where eventually they found a supplier with the help of the International Network for Bamboo and Rattan (INBAR) in Beijing. Even then, distinguishing between the different types of ma, or grass, needed to wrap the joints was a whole other process. Eventually, they found their huangma, but discovered that the strength of a bike’s joints depends as much on the epoxy used to seal the grass around the joined tubes, as the nature of the grass itself. They first sourced a generic epoxy from Hehuachi, Chengdu’s largest wholesale market, but after discovering the epoxy was too brittle to last, they dug deeper. After finding the chemical engineers who developed the stuff in a building a few blocks from their storefront, Jacob and Larry had the engineers customize an epoxy for the bikes—an improvement that has made the joints as strong and as durable as welded aluminum or carbon fiber. Tests indicate joint strength to be far above the threshold needed to import bicycles into the United States. By this point, Jacob and Larry had taken ownership of the project. Mandeep had returned to the road and Dan was busy building his own bamboo prototype for a bike trip south to Thailand. In the weeks after Dan left Chengdu on his custom bamboo bike in January 2014, Source Cycles was born in Natooke’s upstairs workshop. My own bamboo bike was the sixth prototype Source Cycles built. I rode it 15 miles a day for a year and it only broke down once, when the original epoxy failed on the front wheel joint and came apart clean when I hopped a small curb. Since the new epoxy was added, the bike has been solid and dependable, and, most remarkably, it weighs 18 pounds and sells for about $1,500. By comparison, a series of Trek road and mountain bikes from 2013, all made of carbon fiber or aluminum, weigh anywhere between 15-30 pounds and invariably cost several times more than my Source mount. Faced with a traffic jam, I hop off of the bike, lift it over the curb, run a few easy steps, then drop her back into the street and speed off; it feels like parkour on wheels. A group of riders gathers in front of the shop before a night ride through the city. Born in Dallas, Texas, Jacob Klink bounced around the American heartland before landing in Albuquerque, New Mexico—“where people go to get lost.” At the University of New Mexico, he wondered about a life other than that of a bike mechanic trying to work off student loans. After tossing around a few ideas—bike tour through Bolivia?—he took a job teaching English in Tongliao, a city of about one million inhabitants in Inner Mongolia. When his contract ended, he went to Beijing to teach a language course. Larry’s path to China went through the medical field. After six years at the University of Louisville Medical Center in Kentucky, where many of his colleagues were from China or Taiwan, his curiosity took him to Beijing in 2007, where he taught biology at a private international school. Jacob and Larry eventually met in Beijing, where a cycling community was growing around Ines Brunn, who by then had become the undisputed queen of the fixed gear bicycle in China. Brunn, an internationally renowned artistic cyclist, helped make bikes cool again in China, selling fixies out of the original Natooke shop in an alley near the city center. It was while drinking Tsingtao beer and sewing cycling caps at Natooke that Jacob and Larry were struck with the idea of opening their own shop. Although Natooke was the object of some envy in the bike business community, only Jacob and Larry got her blessing to grow the brand. But Ines was a decidedly hands-off mentor. The two young men had to build their own community and develop their own market. They had done some research into up-and-coming cities in China, and Chengdu seemed a safe bet: a booming economy centered around an educated, tech-oriented populace, a strong expatriate community, and a reputation as a bike-friendly city. But custom-made fixed gear bikes didn’t find much traction outside of Chengdu’s foreign residents. It was hard for Jacob and Larry to see colorful “out-of-the-box” fixies on the road, purchased online from Taobao or from shops whose mechanics knew little about the products they sold. Local bike shops would send their clients to Natooke for repairs, but it was no consolation for the bike sales they were missing. The kind of community Brunn helped build in Beijing did not materialize quickly in Chengdu. 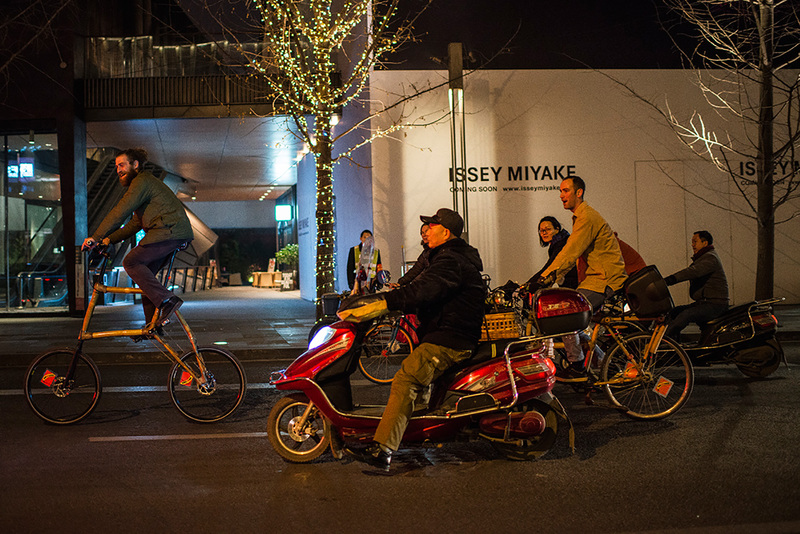 A trickling of expats and young Chinese hipsters discerning enough about what they wanted in a bike were not enough to keep the business afloat. Then Dan and Mandeep floated into town with their dreams of bamboo bicycles. Now, instead of building custom fixies for the niche China market, Jacob and Larry are sourcing bamboo to build custom bikes for the international market. They’ve sold more than 80 bamboo bikes since they started building them in the spring of 2013, almost exclusively to the Western market. Prices start at U.S.$1,949. 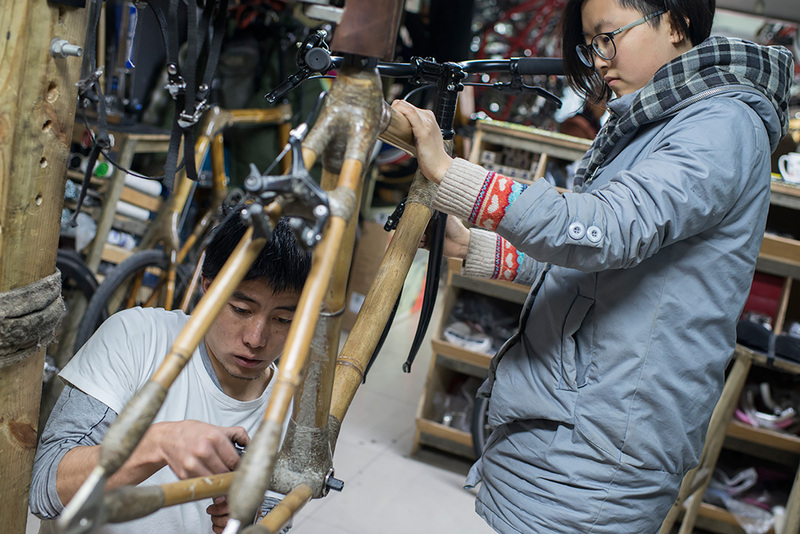 Wen Chen, left, head mechanic, works on a bamboo bike frame as assistant manager Li Sijie looks on. Nobody knows bamboo like the Chinese. Aproximately one third of the world’s 1,200 to 1,500 bamboo species are found in China. The character for bamboo, 竹 (zhu), was carved into Yangshao pottery more than 6,000 years ago. Before the invention of paper, letters were written on bamboo slips; the Dujiangyan irrigation project, built during the time of Christ, used bamboo baskets filled with rocks to hold back the Min River. At the Tang Dynasty-era salt mines in Zigong, a museum claims that bamboo pipes were used to channel natural gas siphoned from the wells to fuel cooking fires. Dai’s manual formed the basis for numerous studies on bamboo over the next 1,500 years, including Li Kan’s seminal work on painting pictures of bamboo, written during the Yuan Dynasty. Bamboo is as much a part of Chinese culture as tea and Taoism. Poets and painters made bamboo their muse and Chinese literature is replete with tales of bamboo forests and the crazy sages, powerful masters, and mysterious gods who inhabit them. Bamboo and rocks form part of the canon for Chinese watercolor art and no Chinese garden is complete without the sound of wind rushing through groves of bamboo. Bamboo is the ultimate alternative resource, able to substitute for almost anything metal, wood, or plastic. Bamboo has been used in China for furniture, food, construction, piping, mats, fishing rods, clothing, and countless other items from chopsticks to weapons. Bamboo is the ultimate alternative resource, able to substitute for almost anything metal, wood, or plastic. Bamboo is still used as scaffolding in Hong Kong, and as flooring in homes and on ocean-going freighters. It is pulped for paper and used as laminate for walls and railings. Any structure supported by steel, aluminum, or carbon fiber poles can be built with bamboo poles instead. Bamboo has all the right features needed to become a 21st century resource. It’s the fastest growing plant in the world, can replace timber and most textiles, and farmers use it to reclaim arid land. Bamboo is also one of the world’s most powerful tools for carbon sequestration, and it can grow pretty much anywhere. China is the largest exporter of bamboo products and leads the world in terms of innovation, quality, and volume. There are government and research institutions, a network of researchers, and whole units at universities that work solely on bamboo innovation. Bamboo is the rare earth of the plant kingdom and China knows it. “They are very serious about this industry,” said Hans Friedrich, Director General of INBAR. But China still wrestles with the task of transmitting its gifts to the outside world. Although ubiquitous in China, bamboo is only very slowly making its way into the modern global economy as an alternative natural resource. INBAR wants to change that, aiming to double its 40 member nations with China’s help. It’s not just a research problem though. Jacob and Larry at Natooke Chengdu spent a year trying to find a bamboo supplier for their Source Cycles who not only knew what they wanted, but also was able to supply consistent quality on demand. Despite the Chinese government’s support of INBAR, a growing network of domestic bamboo manufacturing, and a strengthening body of bamboo research, most business in the bamboo world is done the way Source Cycles did it, by trial and error. Wiseman said that the wholesale movement from timber to bamboo is grindingly slow, delayed by institutional rigidity and by an incomplete scientific picture of the world’s bamboo resources. Other impediments to its widespread use are that bamboo doesn’t come in a uniform diameter—making mass production of fittings, flanges, and connectors difficult—and that it is susceptible to decay if exposed to water and insects, making heat and salt treatment necessary to strengthen the tubes and add longevity. These two issues are part of why the industry is so scattered and fractured. Another issue stems from the fact that the developed world defines forestry largely based on a European notion of landscape dating to the 1700s. According to Kathleen Buckingham, research associate at the World Resource Institute (WRI), most international and intergovernmental institutions still evaluate and manage forests—mapping their potential value and exports—using a timber-based paradigm that never took the tropics into account. Buckingham is working with the WRI and INBAR to help map Ethiopia’s bamboo resources, putting her at the very center of the bamboo movement in which Chinese and Western experts export their knowledge to Africa and Latin America. Local governments seek to implement new management strategies in underdeveloped areas, while start-up bamboo partnerships close to the source create product lines for Western consumers. Ethiopia has over one million hectares of natural bamboo forests—60 percent of Africa’s bamboo resource—but only started developing an industry around them in 2012. Cooperation with China is moving fast, with Chinese experts training Ethiopian workers how to use bamboo as an alternative to firewood for heating through a project involving INBAR and the Nanjing Forestry Institute that ran from 2009-2013. Chinese investors also are helping to establish factories to produce bamboo flooring and chopsticks, paper mills using bamboo pulp, and the infrastructure to harvest, manage, and process the crop for export to global markets. The conversation won’t move forward without innovative companies on the ground doing the tinkering and marketing needed to make bamboo a desirable product—companies such as Source Cycles, where after two years wading through the bamboo forests of southwest China, its founders arrived at a formula that works. Their resulting bicycles are as sturdy as they are beautiful. That they’re sourced from a country such as China, where harsh pollution regularly makes headlines, makes them all the more appealing to the growing global tribe of eco-friendly and action-oriented citizens of our shared Earth. By trying to build a better bicycle, Jacob and Larry stumbled into the vanguard of a movement to re-brand and develop bamboo into a resilient, sustainable 21st century natural resource. In the process, they may yet help change the world’s perception of the Made in China label. Adamson, left, rides a custom bamboo-frame bike through downtown Chengdu.